The Rainbow Knit Skirt by Gorman will have you looking amazing for work functions and cocktail parties! Fun and festive, the must-hire midi skirt features allover pleating in bright metallic colours and a defined waistband. Look chic for your work function by styling the skirt with a classic white button-down and classic pumps. When it’s time for cocktail hour, just add some jewelled tassel earrings and you’re all set! Head over to our blog for more office to cocktails styling tips. 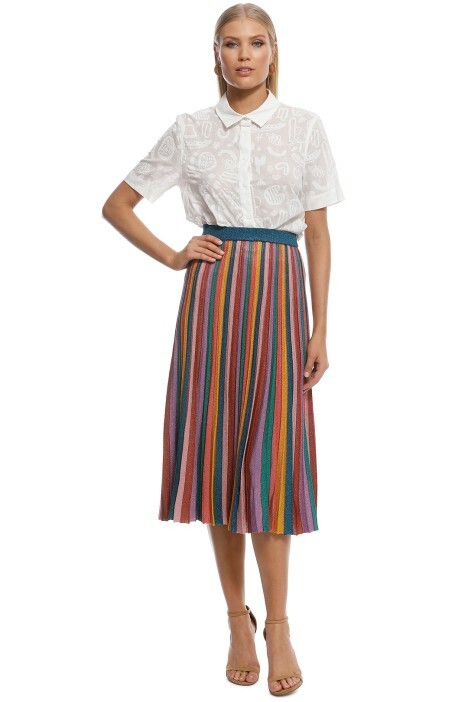 Pair this skirt with a white collar shirt or try Big Sur Shirt by Gorman.